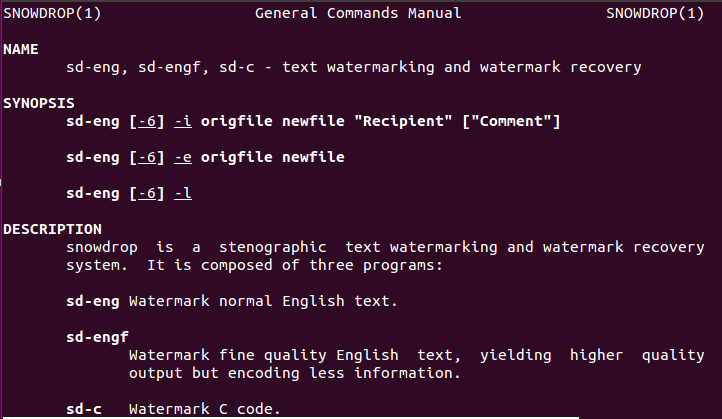 Snowdrop is a free, open source command line tool for Linux operating systems which provides stenographic watermarking of the text documents and source code files. It acts as a leak tracking tool and lets you find out who disclosed your documents or code to the public. It provides a very reliable and hard to remove watermarking on the documents. If someone plagiarizes your documents, you can use this tool to prove the ownership of your crucial documents. The beauty of this tool is the simplicity to install and use. Launch your ubuntu system terminal and run following command to install it. Once the installation is complete, you can run following command to see man pages/help for this utility. In order to watermark some particular text file (say file name is “linuxpitstop.txt”), we will need to run the following command on our linux system terminal. 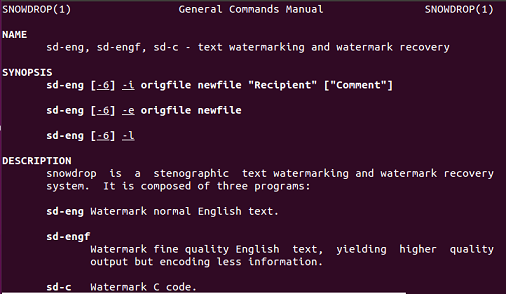 sd-c -i linuxpitstop.txt newlinuxpitstop.txt "Watermaked"
sd-c -i inputfile outputfile "comment"
Now in order to extract the watermarks of your files or compare two files, here is the command syntax. Although this tool is pretty secure and uses redundant steganography to fulfill its design goals, but it is still in the beta phase, so just like any other software in the beta stages, it might have unknown issues/bugs. Try it out today; do let us know if you run into any issues.